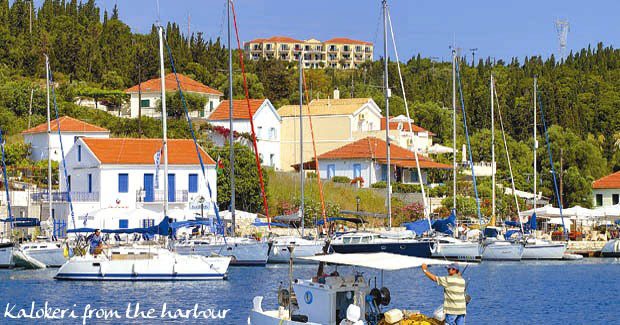 The harbour of Fiskardo in north Kefalonia has earned itself a huge reputation despite being a small fishing harbour. It encapsulates everything that makes the Ionian Islands so special; history, architecture and above all an outstandingly beautiful location. The view of the waterfront with its colourful mix of fishing boats, yachts and the old Venetian lighthouse across the bay is justifiably famous. To appreciate the full grandeur of the setting, one should really walk up the hill and find a glade in the fir forest above the village as suddenly all is revealed in a wide sweep that encompasses the gleaming white peaks of Lefkada, the green hills of Epiros, mysterious Ithaka and the sparkling waters of the Ionian. It is quite simply breathtaking and inspirational. The Kalokeri Apartments have turned dream into reality being a mere ten minute stroll from Fiskardo, the panorama from any of the balconies has to be seen to be believed, a view for all hours of the day and all seasons. In the morning, light and shadow highlight the mountains, by night the sea becomes a dark mirror, dotted with fishing boats as they make their way back to harbour with the night’s catch. At midday with the breeze the yachts spread out past the millionaire’s island of Arkoudi, bound for Meganisi or Kalamos. With half closed eyes, one can imagine the Corinthian fleet sailing north up the channel past the cliffs of Ithaka towards Corfu during the great Battle of Sivota in 420 BC. The breeze settles during the evening and the sun sets beyond Sappho’s Point on Lefkada to the west. Looking down across the tree tops, the pantiled roofs of the village fade and the lights emerge, reflected in the darkening water. The apartments are comfortable and designed to maximise the amazing views, a good size pool for all to enjoy with ample shade on those very warm days and a snack bar for drinks and light lunches. The two bedroom apartments have a twin bedroom at the rear and a double bedroom at the front which leads onto a private balcony. There are also two shower rooms and a balcony leading out from the living room. The one bedroom apartments have double or twin beds with a shower room, living room with a sofa bed leading onto the balcony (air conditioning is in the living area). Studios are extremely spacious and have double or twin beds, shower room and their own sizeable private balconies with those amazing views. Ground floor apartments each have their own terrace. Exploring the fascinating Erissos coast couldn’t be easier; the picturesque Emblisi Beach is less than ten minute walk. Motor boats are available for hire to discover the uninhabited east coast with its bays only accessible by sea, or across to the fascinating island of Ithaka. Kalokeri or ‘Summer’ is one of the more evocative Greek words. It translates literally as ‘fine weather’ and as northern Kefalonia experiences over 300 days of sunshine a year, the spirit of summer lasts a long time here.